– Don’t judge, but I totally bought this “London” sweater by Markus Lupfer. I’ve been a fan of his cheeky, embellished knits for years and now I finally have one! And not only that, but it’s the perfect piece to commemorate the start of my London adventure next month. I plan to wear it with these white jeans when I get there. PS – there’s also a Paris sweater! – These Valentino studded sandals will take you right through summer to fall. Here in Texas you could wear them through the end of October! – Speaking of transitional treasures, this pair of horn hoops by Ashley Pittman are a year-round staple. They’ll go with all of your favorite neutrals seamlessly! – M2Malletier’s bags have been on my wish list for ages, and this snakeskin one is no different. – My infatuation with blush continues in this Chinti & Parker dress. So sweet! This floral print bikini is everything. In love with all of the bright colors in this post! This mini basket is adorable! Such a fun colorful roundup here! Hope you’re having the best week me dear! Oh that’s rhymes! Ha! Loving all these bright colors especially that pillow! 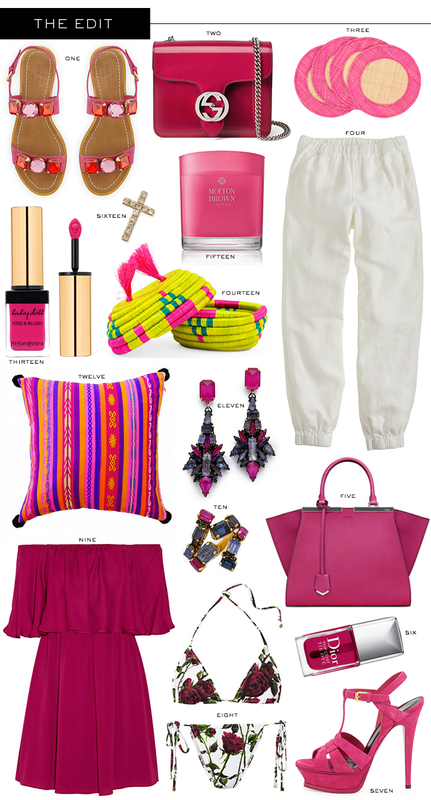 I love the magenta tote! 1. You know all this pink is making me happy! such a striking bikini! So different…love it! Those sandals and that bag! And those colorful jewels! Such a fun roundup! The NET-A-PORTER sale keeps getting better and better. I also love those valentino sandals!